Sometimes a piece of equipment takes a little getting used to before it works itself into the flow, other times it starts pulling its weight from the get go. Our new Cuisinart Griddler is one of the latter. We brought it out to cook the veggie burgers and tofu hotdogs for FirstGrill. However, we quickly realized that this Griddler could do so much more. The flat griddle was perfect for frying eggs and sausages/bacon for breakfast, the ridged side for grilling burgers for lunch, and in combination for searing vegetables/steaks for dinner. 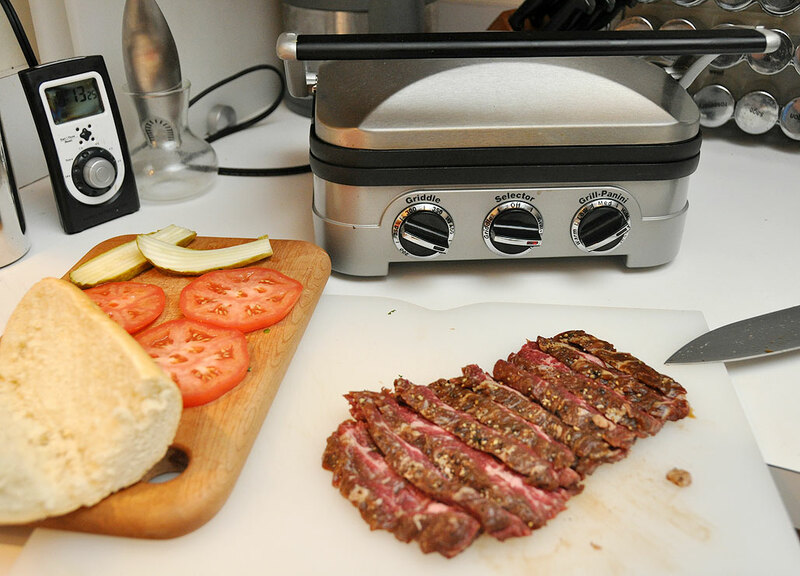 The Cuisinart Griddler is exceptionally well suited for making panini and grilled sandwiches and it is this feature which we want to highlight in the FirstUse review. We had one piece of Morgan Wagyu (Kobe) Bavette steak left over from the FirstGrill. OK…”somebody” put one aside and hid it in the freezer. That same someone “found” it the other day and “sacrificed” it for this Griddler FirstUse article. We whipped up a quick marinade (soy sauce, fresh ground pepper, and salt), let the steak sit in it for a few hours, and cut it up into nice thick slices for grilling. Grilling the kobe beef on both sides at once seared in the juices. The meat was ready in less than thirty seconds. To get a nicely toasted crust on the French bread, we liberally brushed on some olive oil prior to grilling. There was no need to clean the grilling plates because we wanted the bread to pick up the marinade and juices left from grilling the beef. As one can see, the prepared-but-not-paninied-yet sandwich was quite thick. Most grills would not be able to accommodate the thicker stack, but it was not a problem for the Cuisinart Griddler. Thanks to the Griddler’s cantilever design, the top plate was able to lay perfectly flat on top of the curved crust, enabling us to easily press down and flatten the sandwich. There was no sliding or squeezing out of the sandwich filling, so common with hinged grills. The high temperature grill made short work of toasting the outside of the bread without over-cooking anything on the inside. We made this amazingly delicious grilled sandwich in less than 10 minutes. Thanks to the removable non-stick grilling plates, clean up took practically no time at all. If you are looking for a versatile countertop grill for your kitchen, this Cuisinart Griddler should be at the top of your list.